Whitbread, K, Ellen, R, Callaghan, E, Gordon, J E, and Arkley, S. 2014. East Lothian geodiversity audit. British Geological Survey Internal Report, OR/14/063. Cockenzie and Port Seton are located approximately 9 kilometres east of Edinburgh. The 1.7 kilometre long site displays sedimentary strata from of the Carboniferous age Upper Limestone, Passage and Lower Coal Measures formations, which are locally intruded by dykes. The Crossgatehall Fault trends south-west to north-east through the site. This site is the only known natural exposure of the Lower Coal Measures Formation in East Lothian. 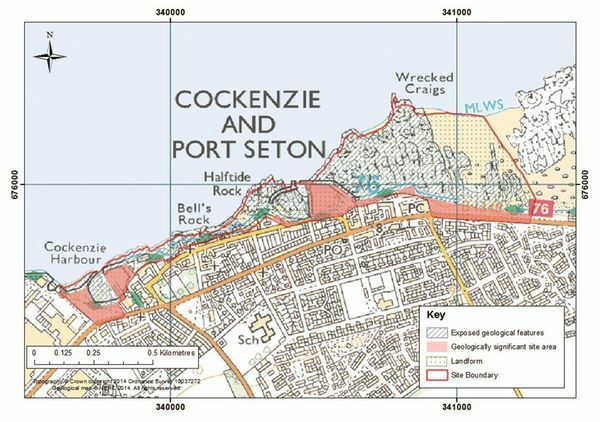 Figure 21 Cockenzie and Port Seton Location Map. The site comprises bedrock exposed in shore platforms and adjacent areas of beach. 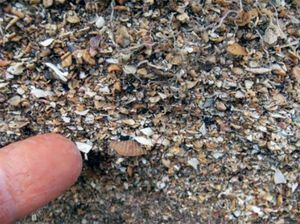 Bedrock exposures likely to vary over time due to changes in beach morphology. Areas of the site important for access or viewing of features are included as geologically significant site areas. The villages of Cockenzie and Port Seton have a long and rich history; their harbours are used for fishing and in the past for the export of local coal. The coal that was mined within the area was used in the process of making salt and also to power the local power station. Cockenzie Power Station (ELC_16 P1) to the west of this site was opened in 1968 and was a major employer in the area but was decommissioned in 2013. The Lower Coal Measures Formation lies at the core of a gentle downward fold (syncline) within Port Seton Harbour. This formation is part of the Coal Measures Group and this exposure is the only one seen within East Lothian. The cyclic sequence shows mudstones, sandstones, siltstone and thin seams of coal which are exposed within the harbour at low tide (ELC_16 P2). 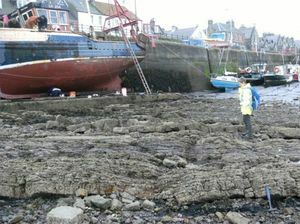 The older Passage Formation (exposed on either side and within the western wall of Port Seton Harbour due to folding) is part of the Clackmannan Group. The Passage Formation comprises a cyclic sequence of sandstone, mudstone, seatearths and siltstone with ironstone and limestone bands. The sedimentary rocks display typical sedimentary structures, including ripples and cross-bedding in sandstone, ironstone nodules within mudstones, and pebbly beds within sandstones, all indicative of formation in terrestrial fluvial environments. In places the sandstone is interbedded with thin mudstone and contains seat clays and palaeosols. Dessication cracks visible in the surfaces of some sandstone beds indicate periodic drying out of fluvial sediments during deposition. Fossilised trace fossils and marine shells are found within the sandstone, mudstone and limestone beds. Soft sediment deformation is also seen within the sandstone beds indicative of flows of sand during or soon after deposition. (ELC_16 P3). Sedimentary rocks of the Upper Limestone Formation are exposed beneath the Passage Formation to the west and eastern margins of the site. The Upper Limestone Formation is composed of cyclic sequences of sandstones, siltstones, mudstones and thin limestones with seatearths, indicative of an alternating marine and deltaic environment (ELC_16 P4). 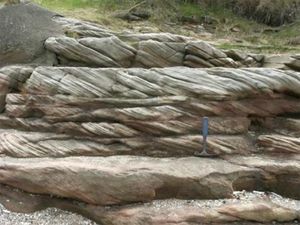 The formation is exposed at Cockenzie Harbour where the strata comprise white to reddish, medium to coarse grained sandstone with cross and trough bedding (ELC_16 P5). Soft sediment deformation structures are well exposed and quartz pebbles are seen within the beds, possibly deposited quickly in a wet environment. The Upper Limestone Formation exposed in the eastern part of the site comprises cyclic sequences of sandstone, which is occasionally pebbly, mudstone with ironstone nodules, siltstone, and prominent limestone with seatearths. 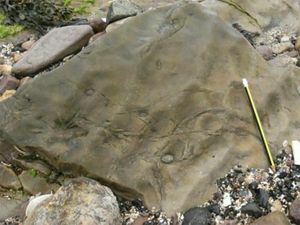 Trace fossils and ripple structures are also seen in some exposures (ELC_16 6). The Calmy Limestone and the Orchard Limestone are exposed within the Upper Limestone sequence in the east of the site. 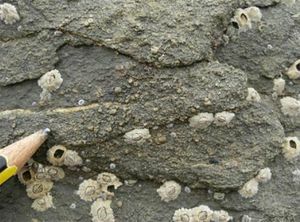 The Calmy Limestone is exposed at low tide and is difficult to identify. It is approximately 40 cm thick and is compact, fine-grained, grey/blue with crinoid debris (ELC_16 P7). The Orchard Beds are seen on the shore and towards the wall at West Links; the beds are separated by beds of sandstone, mudstone and siltstone. Two distinctive beds are seen; the lower bed is grey and contains numerous fossils including brachiopods, corals and crinoids (ELC_16 P8). The upper bed appears to contain more crinoid debris than the lower bed with fewer brachiopods and no corals seen. 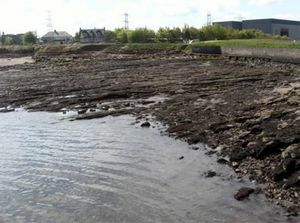 The Port Seton-Spittal Dyke is exposed in this site at Black Rocks to the west of Cockenzie Harbour, and also to the east at Cockenzie old harbour at Bell’s Rocks (ELC_16 P9). The quartz dolerite dyke trends east west and is black in colour with a blocky appearance. Bands of coarser grained crystals can be seen within the rock indicating flow of the magma during dyke emplacement. The rock is fractured with mineralised veins and the larger of these fractures trend north-east to south-west. 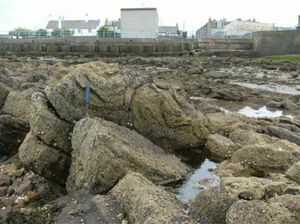 The dyke intruded into the surrounding sedimentary rocks and its contact with the Upper Limestone Formation can be best seen at Cockenzie old harbour. Here the quartz-dolerite is glassy in appearance, with numerous veins. The adjacent sandstone is hard and red with little structure which may indicate baking of the margin as the dyke was intruded (ELC_16 P10). 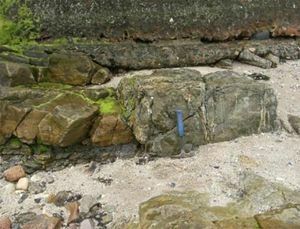 The bedrock strata at the site are exposed on coastal rock platforms in the intertidal zone, which contains minor inlets and small bays. To the landward side of Cockenzie Harbour there is a section of a raised beach approximately 1 metre in thickness; this section contains closely packed shells (ELC_16 P11). East of Port Seton harbour there is a quartz dolerite erratic lying on the strata of the Passage Formation. The site seen at Cockenzie and Port Seton is a broad syncline with axis running approximately south-east, north-west through Port Seton harbour. Younger strata of the Lower Coal Measures are exposed in the core of the syncline with older, underlying strata exposed on the eastern and western limbs. Minor faulting is observed in the Limestone Coal Formation (ELC_16 P12). Access to the coastal site is very good via the John Muir Way which follows the southern edge of the site boundary. 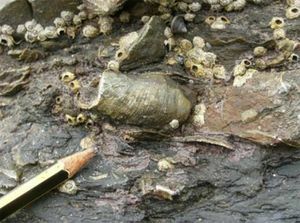 The majority of the exposures only visible at low tide and the sedimentary strata tend to be partly covered with seaweed and barnacles. There is parking within Cockenzie and Port Seton and there are a few interpretation boards along the John Muir Way. Road access and parking There is also parking within the town with access onto the shore. Safety of access Easy access to the shore but all visitors should be aware of the tide times when planning a visit, as the majority of the exposures are only visible at low tide and when exposed can be covered in seaweed. Safety of exposure The rocky exposures have an uneven surface and are often slippery with seaweed. Stout footwear is recommended. The site is exposed to the open sea and the weather forecast should be checked before visits. Access Access along the foreshore/beach, the John Muir Way follows the southern edge of the site. Current condition The rocks can be covered in barnacles and seaweed. The exposures at the landward edge of Cockenzie Harbour and at West Links are clear of vegetation. Restricting conditions Tide: many of the geological exposures are located in the intertidal range and therefore covered at high tide. Nature of exposure Intertidal and beach exposures. Historic, archaeological & literary associations The sea has played an important part in the history of both Cockenzie and Port Seton, Cockenzie has had a fishing harbour since the 16th century and the building of fishing vessels and yachts continued up to the 1990’s. Both Cockenzie and Port Seton harbours were also used in the export of local coal and the locally mined coal was used in the extraction process of removing salt from seawater. Historic houses within or near Port Seton are: Seton Castle, privately owned, built on the site of 17th Century Seton Palace and also Seton Collegiate Church, 15th Century and managed by Historic Scotland. History of Earth Sciences John Muir Way passes along the southern edge of the site. Economic geology Both Cockenzie and Port Seton harbours are still used in the fishing industry and local fish merchants and curers can be found in the town. 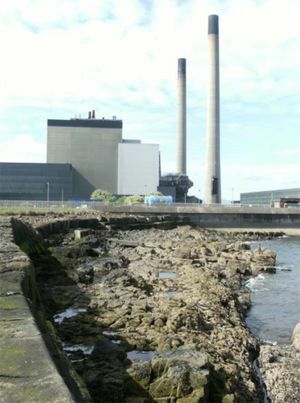 Cockenzie Power Station was opened in 1968 and brought significant prosperity to the area but the power station was decommissioned in 2013. Tourism also adds to the towns in the form of Seton Sands Caravan Park which is located just outside Port Seton. This site displays a sequence of the Upper Carboniferous; the Upper Limestone Formation, the Passage Formation and the Lower Coal Measures Formation. Rare exposures of the Calmy and Orchard Beds Limestones are also found at this site. Cockenzie and Port Seton provides an excellent example of Upper Carboniferous strata with regional lithostratigraphical and palaeontological significance. Community The easy access to the shore and the shore walkway is used regularly by locals. 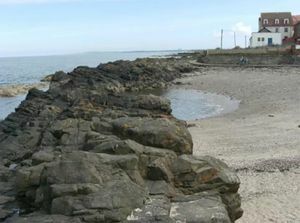 The John Muir Way passes through Cockenzie and Port Seton which attracts visitors from further afield. Education The site displays a variety of features suitable for amateur geologists to study depositional sedimentary environments. The limestone strata exposed in this site offers the study of fossils. The Port Seton-Spittal dyke is well exposed and provides some evidence of contact with the sedimentary rocks. Potential use There are various places where on-site interpretation could be located also a geo-trail extending to Prestonpans could be considered. The area could be studied by, school and higher education. This site contains a good variety of geological features especially associated with sedimentary strata. 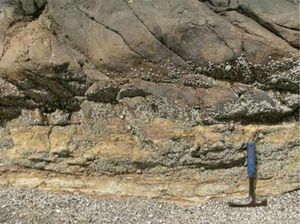 It exposes a sequence of the Upper Carboniferous including the Lower Coal Measures Formation, the only coastal exposure in East Lothian; also the Port Seton-Spittal dyke is seen intruding into this sequence. The sedimentary structures and the fossils seen in the Calmy and Orchard limestones allow interpretation of the depositional environments of each formation. The fossils at this site are one of the best exposures on the East Lothian coast. The coastline is attractive and has easy access. There are numerous possibilities for adding geological interpretation to this site, especially along the John Muir Way. Photo ELC_16 P1: Cockenzie Power Station, looking west. The rocks in the foreground are the igneous rocks of the Port Seton-Spittal Dyke. © BGS, NERC. Photo ELC_16 P2: Port Seton Harbour; thinly bedded strata dipping south-west, of the Lower Coal Measures showing sandstones, mudstones and siltstones, a thin band of coal can be seen in the bottom right hand corner where the hammer is positioned. © BGS, NERC. Photo ELC_16 P3: Soft sediment deformation within the Passage Formation, east of Port Seton harbour, looking south. © BGS, NERC. Photo ELC_16 P4: Upper Limestone Formation dipping towards the south-east exposed within Cockenzie Harbour, looking south. © BGS, NERC. Photo ELC_16 P5: Cross-bedded sandstone of the Upper Limestone Formation exposed near the slipway of Cockenzie Harbour. © BGS, NERC. Photo ELC_16 P6: Rippled sandstone of the Upper Limestone Formation, with trace fossils seen. © BGS, NERC. Photo ELC_16 P7: Calmy Limestone of the Upper Limestone Formation, pale grey/blue with crinoidal debris. © BGS, NERC. Photo ELC_16 P8: Orchard Beds of the Upper Limestone Formation, a limestone rich in fossils including brachiopods and crinoid fragments. © BGS, NERC. Photo ELC_16 P9: Quartz-dolerite dyke known as the Port Seton-Spittal Dyke creating a natural harbour wall at Cockenzie old harbour. © BGS, NERC. Photo ELC_16 P10: Contact between the quartz-dolerite dyke and the sandstone of the Upper Limestone Formation as seen at Cockenzie old harbour. The purplre/brown rock of the dyke can be seen in contact with the pale sandstone just above the handle of the hammer. © BGS, NERC. Photo ELC_16 P11: Shells in the raised bed section at Cockenzie Harbour near the slipway. Photo ELC_16 P12: Faulted strata within the Upper Limestone Formation, the limestone of the Orchard Beds on the right are faulted against the sandstone seen on the left. © BGS, NERC.